The New School for Social Research is a graduate institution in New York City. We generate progressive scholarship in the social sciences and philosophy. Our 75+ full-time faculty members in nine departments offer masters and doctoral degrees to 800 graduate students. Our distinctive intellectual tradition encourages public debate and rigorous academic pursuit, while small programs encourage close collaboration between students and professors. Our faculty of more than 75 full-time scholars creates active and long-lasting partnerships with students. These public intellectual are leaders in their fields of study, shaping public debate, academic research, and pushing the boundaries of social sciences and philosophy around the world. Grounded in theoretical criticism, interdisciplinary exploration, and dissection of the world today, graduate students and faculty at NSSR produce scholarship that challenges the status quo, shapes the present, and leads the future of public debate. Explore their research and work. Become part of a rich, vibrant, and diverse community of dedicated academics and intellectuals. Connect with students and faculty who share your passions and drive to investigate the challenges that face society today. Live in one of the world's most intellectually dynamic cities, New York City. 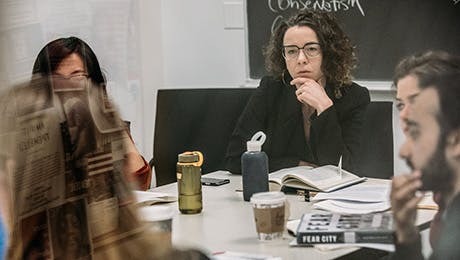 Graduate students at The New School for Social Research develop the skills to boldly question conventional thinking and break down the boundaries of social thought. See stories of our intrepid alumni, shaping the intellectual future of their fields. Get information and support needed to navigate the New School for Social Research application and financial aid process. Learn more about application requirements and key deadlines. The New School Campus offers students world-class academic, housing and dining facilities, located in the heart of New York City's Greenwich Village. Eli Zaretsky is Professor of History at The New School for Social Research. He has taught at Lang College since 1999. His interests are in twentieth century cultural history, the theory and history of capitalism (especially its social and cultural dimensions), and the history of the family. His most recent book is Political Freud, published in 2015 by Cambridge University Press. His earlier work includes Secrets of the Soul: A Social and Cultural History of Psychoanalysis and Why America Needs a Left. He is the editor of The Polish Peasant in Europe and America; and of Capitalism, the Family and Personal Life. “Freudianism and Anti-Freudianism in Recent American Culture,” Constellations, 2018, vol. 25, 165-170. "From Psychoanalysis to Cybernetics: The Case of Her." American Imago 72, no. 2: 197-210, 2015. Rethinking the American Left,” Socialist Register, 2012 (Translation: Merkur 2013). "Psychoanalysis, the Family and Personal Life: Narcissism and the 'Relational Revolution' of the 1960," E.I.A.L. Estudios Interdisciplinarios de América Latina y el Caribe, Volume 18, Number 1, (2007). Special issue on transnational psychoanalysis. “The Place of Psychoanalysis in the History of the Jews,” Psychoanalysis and History, vol. 8, no. 2, 2006. Robert J. Stoller Foundation Award, 1995 annual prize for the best essay on the subject of psychoanalysis awarded for "Bisexuality and the Ambivalent Legacy of Psychoanalysis." To apply to any of our undergraduate programs (except the Bachelor's Program for Adults and Transfer Students and Parsons Associate of Applied Science programs) complete and submit the Common App online. To apply to any of our Bachelor's Program for Adults and Transfer Students and Parsons Associate of Applied Science programs, complete and submit the New School Online Application. To apply to any of our Master's, Doctoral, Professional Studies Diploma, and Graduate Certificate programs, complete and submit the New School Online Application.